What’s so great about self-ligating braces? Self-ligating braces have actually been around since the 1930’s, but recent improvements in technology have made them more popular than ever before. What makes them different? Let’s compare with traditional braces. Traditional braces make use of bands around the brackets to hold the adjusting wire in place. “Self-ligating” means “self-binding” or “self-tying.” These braces also use brackets, but with a very different design. Self-ligating brackets have mechanisms such as “doors” or clips, which hold the wire to the bracket without the need for rubber bands or metal ligatures. All braces types will straighten your teeth. Some orthodontic conditions, such as moderate crowding of the teeth, appear to respond more quickly to self-ligating braces. 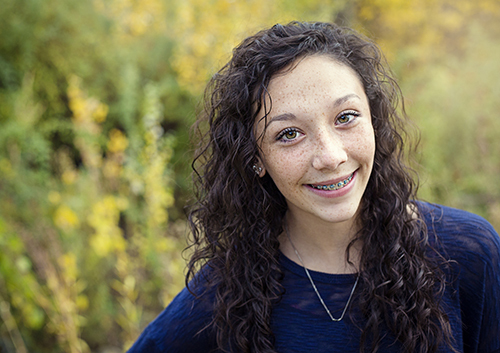 Talk to Dr. Frech about the difference in treatment time that you might expect with different types of braces. Some users find self-ligating braces more comfortable because they reduce friction and pressure on the teeth. Self-ligating brackets are easier to clean than brackets with bands. Bands hold on to food particles and can be difficult to clean completely, leaving bacteria and plaque on the teeth even after brushing. What most people notice first about braces are the colored bands or metal ligatures holding the wires in place. Without these ligatures, brackets are smaller and less noticeable. There are even clear brackets available for an almost invisible look. It you don’t want your braces to make a colorful statement, these might be the choice for you! If you are interested in self-ligating braces as an option in your orthodontic care, give us a call at our Wichita Falls, TX office! We will be happy to explain the technology in greater detail, and to provide you with the best and most complete information you’ll need to make your choice of braces the right choice for you.